The fifth element of the SECTIONS model for selecting media is interaction. How do different media enable interaction? The ‘affordance’ of interaction is critically important, as there is now an overwhelming amount of research evidence to suggest that students learn best when they are ‘active’ in their learning. But what does this mean? And what role can or do new technologies play in supporting active learning? 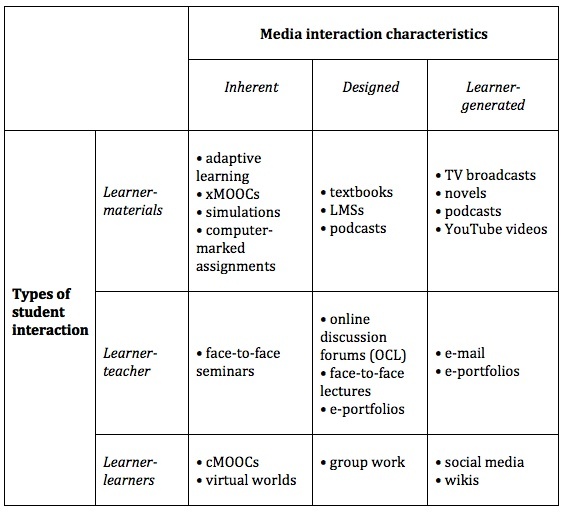 There are three different ways learners can interact when studying (Moore, 1989), and each of these ways requires a somewhat different mix of media and technology. This is the interaction generated when students work on a particular medium, such as a printed textbook, a learning management system, or a short video clip, without direct intervention from an instructor or other students. This interaction can be ‘reflective’, without any overt actions, or it can be ‘observable’, in the form of an assessed response, such as a multiple choice test, or as a contribution to a discussion, or as notes to assist memory and comprehension. Computer technology can greatly facilitate learners’ interaction with learning resources. Self-administered online tests can provide feedback to students on their comprehension or coverage of a subject area. Such tests can also provide feedback to teachers on topic areas where students are having difficulty, and can also be used for grading of students on their comprehension. Using standard test software built into learning management systems, students can be automatically assessed and graded on their comprehension of course materials. More advanced activities might include composing music using software that converts musical notation to audio, entering data to test concepts through online simulations, or participating in games or decision-making scenarios controlled by the computer. Thus computer-managed learner interaction is particularly good for developing comprehension and understanding of concepts and procedures, but it has limitations in developing the higher order learning skills of analysis, synthesis and critical thinking, without additional human intervention of some kind. There are other ways besides computer-managed learning to facilitate interaction between learners and learning material. Textbooks may include activities set by the author (as in this textbook), or instructors can set student activities around set readings. Other student activities might include reading text or watching videos embedded in a learning management system, conducting a structured approach to finding and analyzing web-based materials, or downloading and editing information from the web to create e-portfolios of work. These activities may or may not be assessed, although evidence suggests that students, and in particular students studying online, tend to focus more an assessed activities. In other words, with good design and adequate resources, technology-based instruction can provide high levels of student interaction with the learning materials. There are strong economic advantages in exploiting the possibilities of learners’ interaction with learning materials, because intense student-interaction with learning resources increases the time students spend on learning, which tends to lead to increased learning (see Means et al., 2010). Perhaps more importantly, such activity, when well designed, can reduce the time the teacher needs to spend on interacting with each student. Student-teacher interaction is often needed though in order to develop many of the higher order learning outcomes, such as analysis, synthesis, and critical thinking. This is particularly important for developing academic learning, where students are challenged to question ideas, and to acquire deep understanding. This often requires dialogue and conversation, either one-on-one between instructor and students, or between an instructor and a group of students. The role of the teacher in for instance either face-to-face seminars or online collaborative learning is therefore critical. 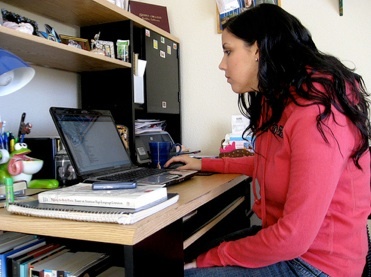 Some technologies, such as online discussion forums, enable or encourage such dialogue or discourse between students and instructors at a distance. The main limitation of student-teacher interaction is that it can be time-demanding for the teacher, and therefore does not scale easily. High quality student-student interaction can be provided equally well both in face-to-face and online learning contexts. Asynchronous online discussion forums built into learning management systems can enable this kind of interaction. Connectivist MOOCs and communities of practice also enable student-student interaction. In a technologically rich learning environment, then, a key decision for a teacher or course designer is choosing the best mix of these three different kinds of interaction, taking into consideration the epistemological approach, the amount of time available for both students and instructor, and the desired learning outcomes. Technology can enable all three kinds of interaction. Different technologies can enhance or inhibit each of the three types of interactivity outlined above. This again means looking at the dimension of interactivity as it applies to different media and technology. This dimension has three components or points on the dimension in terms of the extent an active response from a user is required when a medium or technology is used for teaching. Some media are inherently ‘active’ in that they ‘push’ learners to respond. An example is adaptive learning, where students cannot progress to the next stage of learning without interacting through a test that ascertains whether they have learned sufficiently to progress to the next stage, or what ‘corrective’ learning they still need to do. Behaviourist computer-based learning is inherently interactive, as it forces learners to respond. It is not surprising that technologies that control how a learner responds are often associated with more behaviourist approaches to teaching and learning. Although some media or technologies are not inherently interactive, they can be explicitly designed to encourage interaction with learners. For instance, although a web page is not inherently interactive, it can be designed to be interactive, by adding a comment box or by requiring users to enter information or make choices. In particular, teachers or instructors can add or suggest activities within a particular medium. A podcast can be designed so that students stop the podcast every few minutes to do an activity based on the content of the podcast. This approach can be can applied just as much to textbooks, where activities can be included, as to web pages. In many cases, though, a medium will require the intervention of a teacher or instructor both to set activities around the learning materials and to provide appropriate feedback, thus adding to rather than reducing the workload of instructors. Thus where instructors have to intervene either to design activities or to provide feedback, the cost or time demands on the instructor are likely to be greater than if the other two kinds of interaction are used. Some media may not have explicit interaction built in, but end users may still voluntarily interact with the medium, either cognitively and/or through some physical response. For instance someone in an art gallery may cognitively or emotionally respond to a particular painting (while others may just glance at it or pass it by). Students may choose to make sketches or drawings from the painting. Learners may respond in similar ways to reading a novel or poem. The creators of the work may in fact deliberately design the work to encourage reflection or analysis, but not in explicit ways, leaving the interpretation of a work to the viewer or reader. (This of course is a constructivist approach to learning.) Media that encourage learners independently to be active without the necessary intervention of a teacher or instructor also have cost advantages, although the quality of the interaction will be more difficult to monitor or assess. Thus one dimension of interactivity is control: to what extent is interaction controlled or enabled by the technology, by the creators/instructors, or by the users/learners? It can be seen that this is a complex dimension, once again influenced by epistemological positions, and also by design decisions on the teacher’s part. These categories of interactivity are in no way ‘fixed’, with different levels or types of interaction possible within the same medium or technology. In the end, interaction needs to be linked to desired learning outcomes. What kind of interaction will best lead to a particular type of learning outcome, and what technology or medium best provides this kind of interaction? Feedback is an important aspect of interaction, and timely and appropriate feedback on learner activities is often essential for effective learning. In particular to what extent is feedback possible within a particular medium? Although for instance a learner may respond actively to a poem in a book, feedback on that interaction is usually not available just from the reading. Some other medium will need to be used to provide that feedback, such as a face-to-face poetry class or an online discussion forum. On the other hand, with computer-based learning, once a student has responded to a multiple-choice question, the computer can mark the question and give almost instant feedback. However, with some technologies such as print, providing appropriate or immediate feedback to learners on their activities may be difficult or impossible. Although ‘model’ or ‘correct’ answers might be provided in a text on another page, quality feedback on activities must be provided by a teacher or instructor when using a printed medium. Thus media and technologies again differ in their capacity to provide various kinds of feedback. From a teaching perspective, it is important to be clear about what kind of feedback is likely to be most effective, and then the most effective way to provide that feedback. In particular, under what circumstances is it appropriate to automate feedback, and when should feedback be provided by a teacher, instructor or perhaps a teaching assistant? In Figure 8.6.4 I have analysed the interactive qualities of different educational media along two different dimensions: different types of student interaction; and characteristics of the medium, in terms of whether interaction is built into the medium, or needs to be added through deliberate design, or whether it is left to the learner to decide how to interact. I have allocated a number of different media here according to the type of learner activity they help generate. The actual location though of some of these media will be dependent on design decisions made by the instructor. For instance, a podcast could be accompanied by an activity (designed), or just be a straight broadcast, with the student left to interpret its meaning and purpose in the course (learner-generated). In some cases, an activity may be triggered by one medium (such as a podcast) but the actual activity and the feedback may take place in another medium (such as through an online assessment). Thus it can be seen that media and technology are somewhat slippery when it comes to categorising them in terms of interaction, because instructors and learners often have a choice in how the medium will actually be used, and that will affect how learner interaction and feedback takes place within a single medium. Thus once again the quality of the design of the interactive experiences is as important as the medium of choice for enabling the activity, although an inappropriate choice of technology can reduce the level of activity and/or the quality of the interactions. In reality teachers and learners are likely to use a combination of media and technologies to ensure high quality interactivity. However, using a number of different media is likely to increase cost and workload for both instructors and learners. Once again, there is no evaluative judgement on my part in terms of which media or characteristics provide the ‘best’ interactivity. The choice of medium should depend on the kind of activities that are judged important by a teacher or instructor within the overall context of the teaching. The purpose of this analysis is to sensitize you to the differences between educational media in generating or facilitating different types of interactivity, so that you can make informed decisions. In this case, though, there are no clear media or technology ‘winners’ in terms of interactivity. Design decisions are likely to be more important than technology choice. Nevertheless, technology can enable students separated from their instructors still to get quality activities and feedback, and when appropriately used, technology used to support activities can result in more time on task for students. 1. In terms of the skills I am trying to develop, what kinds of interaction will be most useful? What media or technology could I use to facilitate that kind of interaction? 2. In terms of the effective use of my time, what kinds of interaction will produce a good balance between student comprehension and student skills development, and the amount of time I will be interacting personally or online with students? 1. Go to YouTube and type in your subject area into the ‘search’ box. 2. Choose a YouTube video from the list that comes up that you might recommend to your students to watch. 3. What kind of interaction would the YouTube video require from your students? Does it force them to respond in some way (inherent)? 4. In what way are they likely to respond to the YouTube on their own, e.g. make notes, do an activity, think about the topic (learner-generated)? 5. What activity could you suggest that they do, after they have watched the YouTube video (designed)? What type of knowledge or skill would that activity help develop? What medium or technology would students use to do the activity? 6. How would students get feedback on the activity that you set? What medium or technology would they and/or you use for getting and giving feedback on their activity? 7. How much work for you would that activity cause? Would the work be both manageable and worthwhile? Could the activity be scaled for larger numbers of students? 8. How could the YouTube video have been designed to generate more or better activity from viewers or students? 8.6 Interaction by Anthony William (Tony) Bates is licensed under a Creative Commons Attribution-NonCommercial 4.0 International License, except where otherwise noted.